Over the weekend I finished crocheting a baby afghan which is a gift for a friend's grand-baby that is expected in August. The pattern is one that was given to me by one of my friends (thanks M.E.!) and I'm not sure of the origin. The edging is one that I contrived on my own. I also finished another small area of one of the sections for my wrapping cloth #2 project. Lots (and lots!) of French knots, surrounding 'thrifted' flowers taken from a wedding gown. Today the quote is from Emily Dickinson (and is one of my favourites).... "My friends are my estate"
Another gift and amazing embroidery! came to live with me! One of the members of the Simply Stitch 4 group posted a link to some of the most amazing embroidery and I simply HAD to share it with you. Go HERE! registration for her latest on-line class. The quote of the day, from Albert Schweitzer..... "In everyone's life, at some time, our inner fire goes out. It is then burst into flame by an encounter with another human being. We should all be thankful for those people who rekindle the inner spirit"
This is one of the sections that will be added to my wrapping cloth. There will probably be about twelve (or so) sections by the time I'm done. If you click on 'White 2" in my sidebar you can see the sections I have done already. AND, if you want to see my first wrapping cloth, look under 'White'. The quote for today is from Garson Kanin.... "The best part of one's life is the working part, the creative part. Believe me, I love to succeed, but the real spiritual and emotional excitement is in the doing"
White cloth? What white cloth? Huh???? Yes, I thought it best that you be warned. I don't want to be responsible for any injuries incurred by my readership. The guilt would simply be too much for me to handle. Not only that, I can't afford to send everybody get well flowers and bonbons. You may remember (but then again, you may not. Depends on how far back your memory banks extend)....but eons ago I was working on my second wrapping cloth ( a la Karen Ruane) and it had fallen by the wayside in favour of the Grande Secret Projects of 2014? Well, I've dusted it off and am merrily stitching away on it. 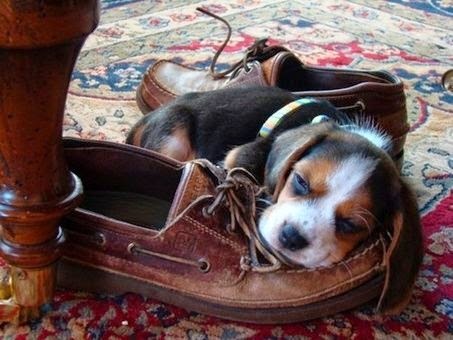 Today the quote, from Carrie Snow.... "No day is so bad it can't be fixed with a nap"
Thank you and be prepared! Firstly, thank you for all the suggestions that you had for my question about a source (and size) for the ribbing I want to put on baby bibs. I know I could simply knit my own, but I had envisioned the type of ribbing that you find around the necklines (and often the cuffs) of sweatshirts. That wouldn't be as scratchy for a baby as something that is hand knitted might. I'm also looking for something with lots of stretch to go over a babies head with ease. I love the suggestion that I simply go to the thrift store and purchase pre-made baby pullovers and 'source' my ribbing from those. Never thought of that and I should have because thrift stores are my favourite places to shop! DH had his knee surgery yesterday and all went well. He's enthroned in his favourite chair, with lots of books and the tv remote in hand and is already announcing that he's bored. Hopefully in a few days he will be able to motor around and not be confined. Poor man....he has to eat my cooking, so if he knows what's good for him, he'll heal fast!! Today the quote is from Leo Buscaglia.... "Life is a great and wondrous mystery, and the only thing we know that we have for sure is what is right here right now. Don't miss it"
I have always found blog readers to be a fountain of information, so I'm going to throw this question out there and hope someone will know the answer (or can send me to the right place). I would like to make some baby bibs that simply pull over the head with knitted ribbing around the neck, rather than ties or snaps. I found one at a craft show a year ago and gifted it to our niece and she says it's the best bib ever. Of course now I can't remember where exactly I got it, nor can I find the pattern. 1) sourcing the ribbing for the neck - in Canada if at all possible. Postage rates everywhere else are out of this world so I'd like to find something here. 2) knowing how big to make the neck in order to fit over baby's head. Any thoughts? Thanks, in advance! Today the quote is from an unknown source (and I thought it might be fitting since I am currently playing semi-nursemaid to my hubby who had knee surgery today)..... " A man too busy to take care of his health is like a mechanic too busy to take care of his tools "
1. I stumbled across the machine embroidery work of Alison Holt and have to say that I'm totally blown away. Go HERE and you will see why! 2. For several years now Karen of My Desert Cottage has been running a popular online studio tour called 'Where Bloggers Create'. I actually took part one year (click on the 'studio tour' category in my side bar and I think you can see some pictures). Anyway, if you are interested in peeking into where some very talented people create their art and finding ideas about how to spruce up your own creative space, go HERE. You'll need more than one cuppa coffee to see them all! And, if you really want to explore there are links to go and see the studios that were on the tour from previous years. From Cullen Hightower..... "The prime of life is that fleeting time between green and over-ripe"
I have stumbled across some things that might be interesting to some of you and, being that I have no pictures to show, I thought I'd mumble today. 1. Registrations are open for a 4 week online course on beading flowers, leaves and berries that sounds like it would be of interest both crazy quilters and beaders. The class is taught by Nancy Eha, who is a leader in the world of beading. Her work is amazing! Go HERE for further information. 2. Kathy Shaw of Shawkl is taking registrations for a second run of her 'Crazy Quilt Embellishment Classes for Beginners' and also for an intermediate course. From all reports the people that were participants in her first beginner class were thrilled with what they learned, so if you're considering learning more about crazy quilting, go HERE to read more about it. 3. For those of us who use rotary cutters and those lovely green Olfa mats, there is an article HERE about how to moisturize your mat to keep it functional for a longer period of time. If you scroll down, there is a further article on how to fix a fuzzy and/or warped mat. (Found via Studio Kat Design newsletter). 4. 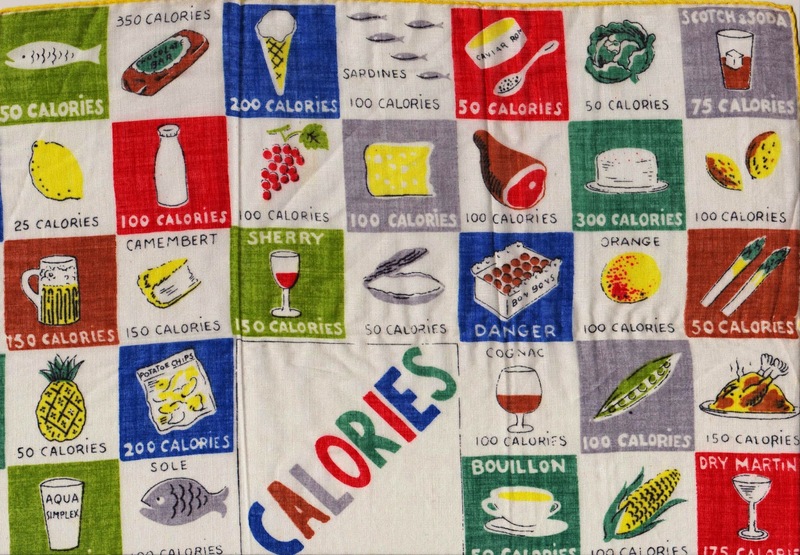 Pam Kellogg is busily compiling a number of wonderful lists of links to crazy quilt artists and people/shops that carry needlework supplies of all kinds. 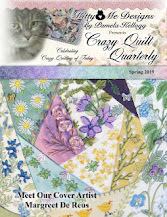 Go to her blog HERE and click on 'Crazy Quilting Resources'. Better pour a cuppa before you do though!! Today the quote if from Mark Twain - "Let us so live that when we come to die even the undertaker will be sorry"
I really must buy a lottery ticket, because over the past couple of weeks I've been gifted with some pretty nice things....totally out of the blue. I must be on a streak of good luck! It's almost too nice to use! Today, my quote is from Edith Armstrong.... " I keep the telephone of my mind open to peace, harmony, health, love and abundance. Then, whenever doubts, anxiety, or fear try to call me, they keep getting a busy signal - and soon they'll forget my number"
Be sure to click on it, and look for the calorie content of the bonbons! The quote of the day is from Leo Buscaglia.... "There are two big forces at work, external and internal. We have very little control over external forces such as tornadoes, earthquakes, floods, disasters, illness and pain. What really matters is the internal force. How do I respond to those disasters? Over that I have complete control"
I can finally tell you a little bit more about the 'great secret project # 1'! 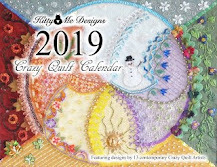 Pam Kellogg, who will be the new owner of the 'Crazy Quilt Gatherings' magazine starting in January, has announced the names of the artists that will be taking part in her 2015 calendar project. Guess what? I'm one of them!!!! Go HERE to read more about it and to see the names of the other wonderful artists that I am joining. I'm very excited about it and must admit that I now feel as though I've 'arrived' in the crazy quilting scene!! Thank you Pam for asking me to be part of this and now I can't wait to see what the rest of the pin-up girls have created. Alas, though, I still can't show you any pictures! You'll just have to wait until September when the calendar will be released. Today the quote is from Chandler Fuller.... "The brain simply believes what you tell it most. And what you tell it about you, it will create. It has no choice"
I thought this flaked-out puppy was such a cutie! 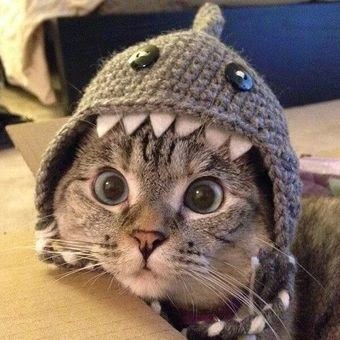 And the eyes on this kitty - somehow they fit the hat! I'm sorry that I don't know the source of either picture. If you do, let me know and I'll be more than happy to give credit. I just recently received a book I had ordered from HERE and I must say that I'm really happy with their service. They are shipping from England and I got my books in a week, much faster than Amazon most times. They're a bit cheaper too, at least on the books I got and they also have free worldwide shipping. Pretty amazing. Now to the winner.....hubby drew Carol of the blog Beads & Birds out of the hat (well, it was a margarine tub actually, but close enough). Send me your snail mail addy Carol and I'll send you the doll of your choice. Thanks for playing.